Drama lessons during Wednesday lunchtime seem to be as popular as ever! Boys at Merchant Taylors’ come once a week to these exciting yet very productive classes. 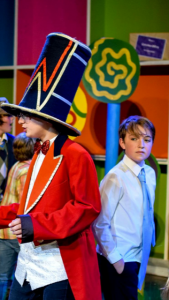 They have the opportunity to take LAMDA Examinations which are fully accredited and 100% pass rate has been achieved to date with all our talented boys gaining Merits and Distinctions. In addition to the obvious enjoyment these classes bring they are also an excellent exercise in boosting confidence and character building which stands the boys in good stead in later life! Classes are open to boys from years 3-6 and should any be interested in joining, please contact Sherril Parsons directly to reserve a place for September ‘18.